I was just eleven, at a seriously strict Catholic convent in Buckinghamshire, preparing for my Confirmation. My mother made my Confirmation dress and the nuns thought it was too short which was very upsetting. I was unhappy at school but had become very religious and decided that what I really wanted to be was a nun. I used to lift back the covers of my bed to let my guardian angel in to bed with me. I also believed I was Charlotte Bronte reincarnated. No wonder I ended up a playwright! Totally bonkers…. My parents were having affairs with another couple and I knew this because I had discovered one of my father’s love letters to his mistress in his pottery equipment tray on top of the cup cupboard. They went to a lot of parties and I was left in charge of my younger sister who was a chronic asthmatic. I had already discovered by the age of eight that writing poetry was a way to deal with the emotional problems in life and so this was my emotional outlet. I had already begun to write a novel, which my best friend used to edit for me because I was not a good speller! I had no sense of what was going on in the world… The students in Paris or anything… I was having my own emotional war, the effects of which were to rebound on me much later in life. Only now have I really begun to understand it all. In 1968 I was in Lourenço Marques, having the time of my life on a silver bicycle and a dinky sail boat. It was also then that I had just started reading my father’s secret books (. . . Freud was banned, Marx was banned . . .), going to The Film Club (a seed bed of local discontent), listening to the news, and slowly understanding that something was happening elsewhere that meant that we had to change the world. I saw no colonial war – it was too far away – but I saw police repression, military arrogance, clerical intolerance and, specially, I discovered the danger of talking. In May 1968, my interests were as far away from politics as I could get! I was caught between the crazy razzle dazzle of the pop world and my Middle Eastern background which required me to get married at a very young age. The year before, in August 1967, my boss died of a drug overdose. He was Brian Epstein, the manager of The Beatles. Although I was very young, I had been working in London as one of his Personal Assistants. The four boys, John, Paul, George and Ringo, seemed to rule the world at that time. There was hysteria, excitement, glamour, and thrills. We were all so young and naïve . . . and life was glorious! However, after Brian’s death, I returned to Manchester (my hometown) to work for the impresario, Harvey Lisberg. He managed Herman’s Hermits, The Who, 10CC and several other pop groups. In 1968 whilst I was working closely with Harvey, my experiences in the North were far less exciting than they had been in London. My parents continued to voice their expectation that I get married. A girl, in those days, and in their tradition in particular, had reached the end of her shelf-life by the age of 23. But I was a child of a new generation. I defied my parents’ wishes and accepted the opportunity to return to London to work for a young Giorgio Gomelsky who managed the Stones then, produced the Yardbirds, and had just started Marmalade Records. However “tradition” got the better of me. At the eleventh hour, I got married and never returned to the pop world. The ‘60s was a period of intense excitement and innovation. I consider myself really lucky to have been surrounded by such tremendous talent and energy. I still have to get up and dance when I hear those ‘60s tunes! We didn’t have May ‘68 in Perth. Everyone had turned their lights on for John Glenn in Friendship 7 in 1962 and we earned the title “City of Lights” and we all cried for JFK and his little kids on November 1963. But May ‘68 was somehow swept under the carpet. As a twelve year old in my first year at high school, it was the swimming sports, Simon and Garfunkel and taking our hems up as far as we could that concerned me and my classmates. My father and other professionals, all graduates, couldn’t resist the odd crack about revolting students but that was about it. I had a sense of big events happening “out there” but they involved the big kids, not us. I fully support the devolution of the Baby Boomers into two groups: those born before 1954 and those born afterwards. Older Baby Boomers cleared a new path, post ’54 (or even ’52) Boomers just followed. I do remember an aunt earnestly advising me not to go to university and recommending I became a librarian, an eminently suitable occupation for a girl and one which didn’t involve university. Perhaps May ‘68 was considered to be such anarchy that ignoring it would reduce its credibility. Or so subversive that it could only be whispered about and not in front of the children. Those students were definitely not considered to be desirable role models for the youth of Perth. I visited Louvain as a young architect in 1979 to look at a housing development and travelled with a lawyer from Sydney who was a few years older than me. We talked at length about May ‘68. He knew the history well. But in sleepy, late 1970s Belgium, ’68 still seemed to have occurred elsewhere, and involved others. It was fascinating living there then. My husband of the time was a reporter for the Washington Star. I love politics. I have since forgiven LBJ who is actually one of my heroes – mainly for the Civil Rights Act. A shame Vietnam overshadowed the good stuff. In 1968, I was a newly graduated but not fully-fledged doctor. I was working at Groote Schuur Hospital in Cape Town as a Houseman. The Parisian events in May that year seemed very remote. My recollection is that although we were aware of their occurrence, the South African press, and especially the state-controlled radio (there was no TV), painted a picture of rioting by communist-controlled mobs. Communism was the universal enemy of the apartheid establishment, and riots of this nature were depicted as evil and malevolent. Although relatively progressive and liberal in South African terms, academics and students at Cape Town University and Medical School were de-politicised by fear of reprisals for involvement. As a consequence, the Parisian events went by with hardly any comment or debate. None of the spirit of rebellion reached the Cape shores: the status quo was undisturbed. The May ’68 events seemed to be over almost as soon as they began. Forty years is a long time. Memories fade. I was vaguely interested in what was going on in Paris in May but was mainly caught up with the masses of posh, pretty girls at York University where I was teaching at the time. Yet I was on the staff-student committee and found the minor discontents of the students could be quite upsetting and were certainly time-consuming. After matters blew up in Paris in May we were meeting almost every day. I can’t really remember what the students wanted – maybe it was a course in Marxist economics or the history of the Paris Commune. It might have been a halfpenny off the price of a half – I think 10d at the time – in the college bars. But they were certainly aggressive about what they construed as their rights. Any attempt to reason with them was met with the retort that reason is a weapon of the bourgeoisie. I think the staff members on the committee were quite prepared to disarm but found it difficult to function without that particular tool. I wasn’t sorry to get away that summer to New York where I would spend a year teaching at NYU. There the students were like lambs, had never heard of Danny le Rouge and wouldn’t know a barricade if it hit them. Their main interest in Europe was in the Beatles’ songs – “Hey! Jude” was the latest hit. When I got back to York a year later it was all peace and harmony – but I was glad not to go back onto the staff-student committee. Revolutions are so unpredictable. May ’68: For me the event didn’t exist – and still, in many ways, doesn’t. I suppose I’m just not a very political animal, and when I got to university, even in a charged environment like that of South Africa in the 1970s, was never involved in the student movement or political protests of any kind. I was, in May ‘68, in my first year of high school in Johannesburg, definitely more concerned with boyfriends and art and youthfully high-minded reading (the likes of D.H.Lawrence – or Camus, whose political relevance I didn’t then get anyhow) than in current affairs, outside of the most pressing issues that concerned us in South Africa. 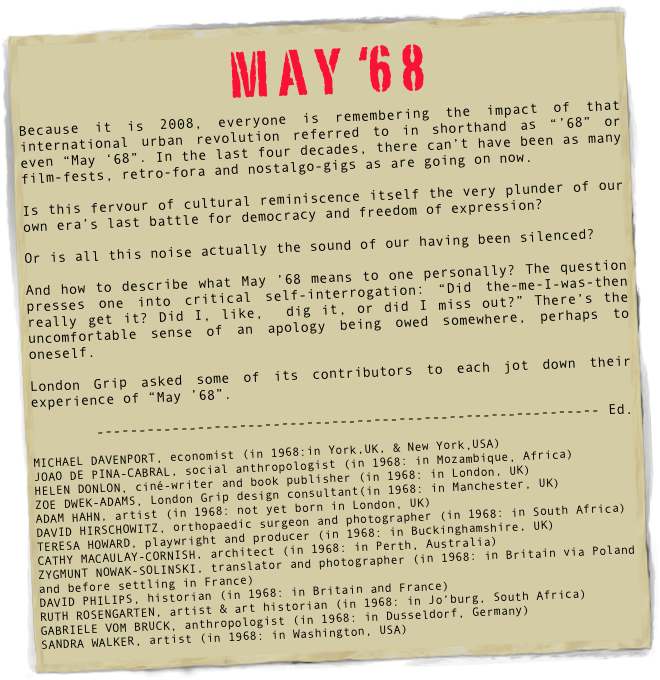 The first I heard of “May 68” came quite a lot later, in the context of “Fluxus”. As you can see, it has left no mark on me! The sixties was the long hair era and tight flares. You have brought on a whole surge of nostalgia and reflection as to what and where I am now. I shied away from the camera. Wanted to be on the other side. To be the intruder – which I was, over the years, as a photographer. I vaguely remember there were student demonstrations in Poland in March ‘68 but the world paid little attention. As for May ’68, I was a youth wandering the streets of London. In a bit of a daze in the big city. Aware of what was happening around me. Forming my philosophy of life, though unconsciously. There was a lot of rock ‘n roll about, which I was drawn to, and it would influence me all my life. But May, the spring, was quiet in my little world. I worked here and there. There was no thought of a “Career”. I was starting to fill the first blank page of my life. The outside world did not intrude as it does these days, bombarding us with information and “Breaking News”. I heard about the French May ‘68 but at that stage I was not French. 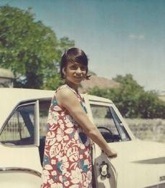 I was in France in July ‘68. Drifting. In search of the indefinable. As I suppose I am still now. Though it doesn’t seem so important these days. There were expectations which took form then, withered or floated away as another distraction came along. In some ways at that time I didn’t take things seriously enough. I remember the anonymity of it all. I knew people, I interrelated, somehow, as best I could, but had little effect on my immediate world. I think I was curious, not driven but interested; perhaps that’s why I took to photography later. I could stand behind a “device” and observe, and record the event. That’s not to say I was not the instigator, a hunter in a sense. But practically, what did I do then? It’s a long way back . . . You would be speaking to another person. I don’t think I was involved in any mission. There were people I met who were involved in the sense that they had had to abandon their country, as I had done mine. An escape? From what? I did not know then, but I think I’m getting closer to knowing now. But what is most important, it’s been interesting. On May 19th 1968, the Cannes Film Festival was brought to an abrupt and hostile closure. It was the culmination of weeks of tension on the streets of Paris following the eviction from the Cinémathèque Française of the much-adored president, Henri Langlois; and was also a manifestation of support for the workers’ strikes and student unrest, and the attendant CRS violence that had spread throughout France.<http://http://www.youtube.com/watch?v=zgWVrZbXmJE> At the helm of the Cannes interruption were cinéastes Jean-Luc Godard, Louis Malle, Roman Polanski, Francois Truffaut and other filmmakers and critics from the Cahiers du Cinema/Cinematheque circles. That day was my fifth birthday. I was in London, a quiet child with my first watch (a Timex) and an early hankering for my first great love – books. But despite my young age and calm obliviousness there were monumental events manifesting across the channel in what was to become my favourite city, a city in which I would study and live and more importantly become culturally entangled with, in a profound and lasting way. Paris was burning. This period in French cinema and counterculture is a source of endless fascination to me and I have not only watched just about every important film made by the conscious French filmmakers of the day, I have also read probably every account in print, and mainly in French, of the events of May 1968 in Paris, as told by the more interesting participants. Actor and filmmaker Pierre Clementi, whose life story I have chronicled in the latest edition of Habits of Waste <http://www.habitsofwaste.wwu.edu/> , is just one example. In May 1968 I was at Magdalen College, Oxford (as a Rhodes Scholar), doing a B.A.degree in History – my second, because I already had a B.A. from the University of the Witwatersrand in Johannesburg, South Africa. I followed the news of “les evenements du Mai” closely from England. In July, I went to France to do a summer course to learn French, which I had booked well before May. The course I did was at the University of Aix-en-Provence, in the south. I visited Paris on the way, where the signs of “the events” were still to be seen everywhere. There were the slogans the students had written on the walls; there were the frighteningly thuggish-looking CRS squads looming menacingly on many street corners. Even in Aix, one could see some signs of it. The University, like all the French universities, was closed as a result of the events; and only we foreign students and our instructors were allowed inside. We had to show our identity cards every time we went on the campus (where we were staying, as well as having our lessons). The few local students who were showing us around informed us proudly that they too had had their own “evenements” in Aix, on the same lines as Paris – but I have no idea how true that was or what it involved. It was a wonderful summer month in Aix, which has left me with a permanent love for Provence and its hot sun and harsh landscape – bliss for a South African who was badly missing the sun and some arid land after England’s damp and green mush. I am afraid I was a young kid then. I only remember seeing marching youths on TV! I wasn’t yet born in 1968. I don’t even think my parents had met in ’68. I wasn’t yet even a twinkle in my mother’s eye! copies of a few of the many posters which became famously associated with Paris, 1968.